D.L. Hughley's relatively new CNN weekly news show D.L. 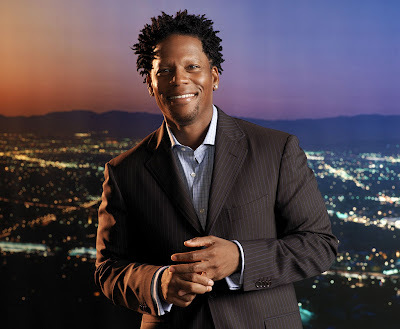 Hughley Breaks The News is scheduled to cease filming at the end of this month. The controversial Saturday night news commentary is reportedly ending because D.L. wants to be closer to his family in L.A., rather than filming in NYC. CNN released the statement, "D.L. approached CNN about being permanently based in Los Angeles, where his family lives. To accommodate this, we agreed upon a new role where he will be a contributor for the network based in Los Angeles. We are eager to continue our relationship with D.L., who is a tremendous talent and a valued colleague." The show caught flack from the African-American journalist community for "perpetuating stereotypes." Recently, the news-comedy hybrid made the national news when GOP Chairman Michael Steele made controversial statements about Republican voicebox (and garbage spewer, in my opinion!) Rush Limbaugh. I don't think D.L. is the funniest guy on the planet, but I was happy that CNN had given a Black male a platform to interject his thought son the nation and day-to-day politics. In that regard, his show will be missed. I only saw one episode of Breaks The News, but I saw it as more comedy that news and for the flack that he received, I find it pointless because we all know comedy is built around stereotypes. I hope that he will be visible in his new capacity at the network.